As you might have noticed I love Mac N' Cheese. I even have a recipe for it crock-pot style. Since making that I have been on the hunt for a good, cheesy, low-calorie baked mac n' cheese. 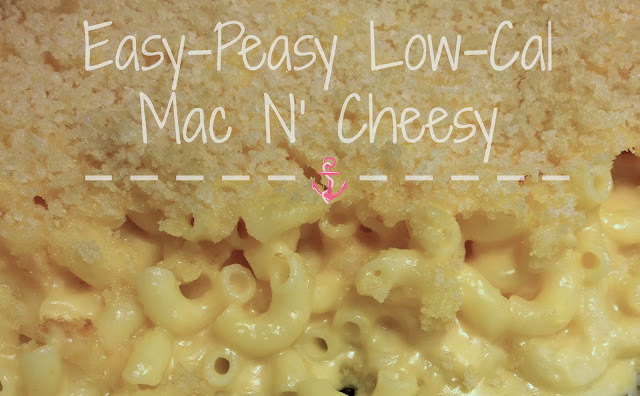 And I know what you're thinking mac n' cheese and low-cal don't go together! Well as of last night they do! I made this delicious, exteremly cheesy, and creamy mac n' cheese and it was sooo simple...since I hate to cook and all! So please, give it a try, make your own unique alterations, and let me know how it turns out! 1. Cook macaroni until halfway done. It will finish cooking when it is baking. If cooked completely then it will get mushy while baking, and no body likes mushy pasta! 2. In a large skillet on medium heat, melt 4 tbs of butter. Slowly add in flour, making a roux. Once it's all combined add in the milk. Stir until all is mixed. Then add in all the cheese. Stirring occasionally until all the cheese has melted and you have a thick sauce. 3. Pre-heat oven to 350. 5. Once cheese mixture is done melting, pour on to the pasta. Mix thoroughly! 6. Melt remaining 2tbs of butter and panko crumbs in a bowl. Stirring until they are mixed completely. Then cover pasta. 7. Place mac n' cheese in the oven and cook for 30-45 minutes. Once done, the edges will be bubbling and the topping will be slightly golden. 8. ENJOY! Of course with a BIG glass of vino! and it's low cal?!?!?! yum! Oh yum! I'm thinking my little would LOVE this stuff!